This tutorial intorduces the reader to common techniques and patterns used in the Debugger Services Framework (DSF), which is developed by the C/C++ Development Tools (CDT) project. It also gives a good overview of the framework's more advanced features. The Debugger Services Framework is a new API for integrating debuggers into Eclipse. It is an alternative to the Standard Debug Model API in Platform and it leverages the new Flexible Hierarchy API that allows extensive control over the debugger views' contents. It is also designed to help achieve better performance when debugging applications on slow or remote targets. 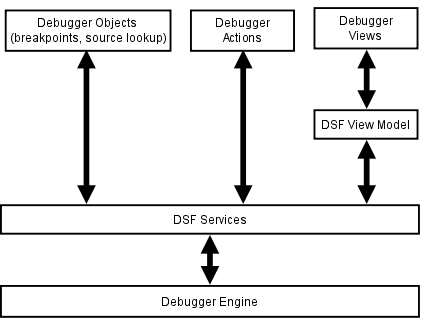 The diagram below shows the elements used in typical debugger integration and where DSF fits in. HIgh level view of elements used in a typical DSF-based debugger integration in Eclipse. Using Update Manager, install the Programming Languages -> Eclipse C/C++ Development Tools feature found in the Helios Discovery Site (http://download.eclipse.org/releases/helios). Check out the org.eclipse.cdt.examples.dsf plugin, found in the /cvsroot/tools CVS repository under the org.eclipse.cdt/dsf directory. Execute the build the first time to build and run the exercises preprocessor. Refresh the resources in the plugin (right-click on project in Navigator and select Refresh), in order to recognize the sources generated by the preprocessor. Build the plugin again to compile the generated sources. Examples in data org.eclipse.cdt.examples.dsf.requestmonitor and org.eclipse.cdt.examples.dsf.dataviewer packages each contain a public main() function. They can be launched using the Java Application launch type. The timers example in org.eclipse.cdt.examples.dsf.timers requires an Eclipse Application to be launched (see the Timers Example section for more details). One of the central features of DSF is that it relies very heavily on the use of asynchronous methods. Asynchronous methods here mean simply methods that use a callback object to indicate their completion. The use of asynchronous methods can be very contagious in a system, where if a lower level API is composed of asynchronous methods, a higher level system which uses those methods also has to have asynchronous methods in its interface (or risk blocking its calling thread). Executor - A argument to the request monitor constructor allows the user to specify what executor should be used to invoke the callback method. Status - Asynchronous methods that take a callback can always set the status indicating the success or failure of the call. Callback Methods - The request monitor declares several protected methods which are invoked when the callback is invoked: handleCompleted(), handleOK(), handleError(), etc. The users may override these methods as needed to perform additional processing upon asynchronous method completion. Parent Request Monitor - If the method calling an asynchronous method is itself asynchronous, it may set its argument request monitor as the parent of the request monitor it is creating. The parent request monitor will be automatically invoked when the lower level request monitor is completed. Line 29 creates an "immediate executor". Unlike more sophisticated executors, the immediate executor simply invokes the runnable it receives immediately. It does not use any threads and it will never throw a RejectedExecutionException. Line 30 creates the request monitor. This program does not perform any processing after the callback is invoked, so it does not override RequestMonitor's completion methods. 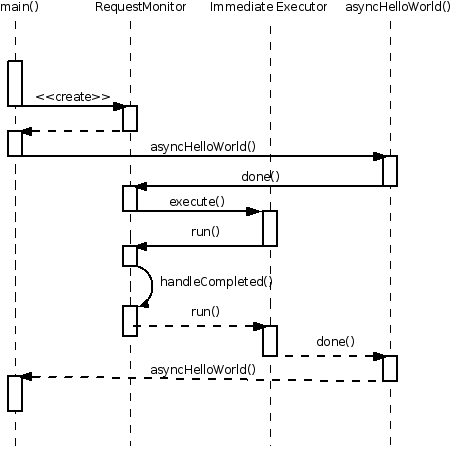 Sequence diagram of the AsyncHelloWorld example. Exercise 1: A common problem in DSF is implementing nested asynchronous methods, this exercise adds a second-level asynchronous method to AsyncHelloWorld. Look for comments preceded with "// TODO Exercise 1" in the org.eclipse.cdt.examples.dsf.requestmonitor.AsyncHelloWorld module. Lines 26-27 create the data request monitor using a local class declaraion. Note the type parameter to DataRequestMonitor allows for compiler checking of the type when calling getData() and setData() methods. Lines 29-31 override the standard callback to print the result of the calculation to the console. A common problem when using asynchronous is that several asynchronous methods need to be called in parallel, so the calling method needs to somehow manage the completion of several request monitors. CountingRequestMonitor can be used for this purpose. It is configured such that it's done() method needs to be called a count number of times before the callback method is invoked. Lines 52 and 53, use the same instance of counting request monitor when calling the sub-routine. Each sub-routine will call done() on the counting request monitor. Line 54 sets the count to the number of sub-routines called with the counting request monitor. Note that the done count can be set after calling the sub-routines, because the counting request monitor will not be completed until the count is set. Line 55: Don't forget to complete the request monitor in all execution paths! Note: The use of a parent request monitor can simplify the code when implementing nested asynchronous methods, since the parent requrest monitor is automatically completed when the child requrest monitor is completed. Unfortunately, failing to specify a parent request monitor when it is expected can sometimes lead to bugs. Exercise 2: Converting a synchronous method into an asynchronous one is another common task in DSF. This exercise converts the AsyncQuicksort.partition() method into asynchronous AsyncQuicksort.asyncPartition(). Look for comments preceeded with "// TODO Exercise 2" in the org.eclipse.cdt.examples.dsf.requestmonitor.AsyncQuicksort module. The simple examples in previous section used asynchronous method signatures, however no real asynchronous work was performed since all execution was performed in the main thread. This section examines a more typical example of a problem that DSF is intended to solve: a viewer and an asynchronous data generator. 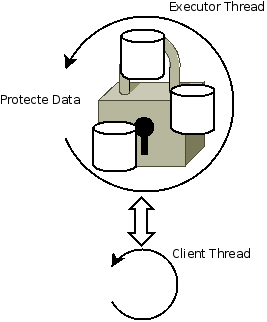 DataGeneratorWithThread - Uses a java thread directly and various synchronization mechanisms for data integrity. DataGeneratorWithExecutor - Uses a DSF executor for both asynchronous execution and synchronization. SyncDataViewer - Table-based viewer which implements a synchronous IStructuredContentProvider interface. AsyncDataViewer - Table-based viewer which implements an asynchronous ILazyContentProvider interface. 59:         // Create the query object for reading data count. 68:         // interface and it has to be executed in order to do its work. 73:         // monitor of the execute() method is marked done. 77:             // InterruptedException and ExecutionException can be thrown here. 79:             // if an error status is set to the Query's request monitor. Line 60 creates the query object. Line 69 submits the query to an executor. This is very important, because a Query object simply implements Runnable, it will not perform the work in its exectute() method unless it is submitted to an executor. Line 75 blocks while calling the java.util.concurrent.Future.get() method, implemented by Query, until the request monitor from the execute() method is completed. Detailed sequence of calling IDataGenerator.getCount() in SyncDataViewer.getElements(). Note: Using the query object requires a great deal of care because calling a blocking method can create performance problems and raises possibility of deadlock. One common deadlock scenario occurs when the get() method is being called by a thread which is itself required for completion of the asynchronous methods called by execute(). Line 174 declares the addListener() method which can be called on any thread. Line 176 submits a local runnable to the DSF executor. Line 178 accesses the protected data: fListeners. Note: It is immediately apparent that this synchronization mechanism adds a lot of overhead and for such a simple example, it is much less efficient than using a synchronized section or an atomic variable. It is less obvious how this mechanism adds value, however this document is just a tutorial so the discussion of the merits of the design will be left out. Synchronization using multiple locks on data. Synchronization using a single DSF executor thread. 143:                 // ensures that that the random changes get processed. 146:                 // If a request was dequeued, process it. 148:                     // Simulate a processing delay. 157:                         // loop and thread will exit. 163:                 // Simulate data changes. Line 141 creates the loop that runs continuously until the break statement on line 159. Line 149 implements the artificial processing delay that is executed for each request. 201:         // If a queue servicing is already scheduled, do nothing. On line 202, the fServiceQueueInProgress flag is used to ensure that the queue servicing runnable is not scheduled too often. Line 211 removes the top request from the queue. 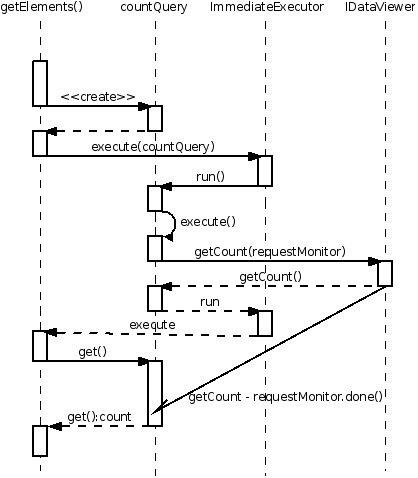 Line 212 calls the ExecutorService.schedule() method to run the queue servicing runnable, with a delay that simulates the request processing time. Line 224, after servicing runnable is finished, calls serviceQueue() again to process the next item in the queue. Note: When using a single-threaded executor as the synchronization method very few other synchronization mechanisms need to be used. For example the DataGeneratorWithExecutor.fQueue member is just a plain un-synchronized list. This is true even when using background threads to perform long-running tasks, as long as these background threads can call a request monitor when finished. Exercise 3: One benefit of the single-threaded executor concurrency model is that as long as a method is guaranteed to run in the executor thread, this method may access and modify any of the variables protected by this executor. This exercise demonstrates performing a somewhat more complicated operation on protected state data. Look for comments preceeded with "// TODO Exercise 3" in the org.eclipse.cdt.examples.dsf.dataviewer.DataGeneratorWithExcecutor module. In any multi-threaded system it can become very difficult to determine what are the rules governing access to the various data objects. In a DSF system, it is even more important to identify which data objects can only be accessed using a designated DSF executor. Since there is no Java language mechanisms for this purpose, DSF defines a number annotations that can be used for this purpose. The annotations are hierarchical, so that if a class has a given annotation in its declaration, its members and fields are assumed to have the same access restriction unless otherwise specified. ThreadSafe - Indicates that the given element can be accessed on any thread. Typically, if this annotation is used, the given member or class uses synchronized or atomic objects to protect its data. Immutable - Immutable objects cannot be modified after they are created, thus they are also thread-safe. The easiest way to make an object immutable, is to declare all its fields final and make sure that its fields are also immutable. Examples of immutable objects are Java Strings, primitive object types, etc. ConfinedToDsfExecutor(executor) - Indicates that the given object can only be accessed using the given executor. The executor parameter is a string (since that's the only allowable parameter type to annotations), but it should indicate the executor, using classe's member and method names. ThreadSafeAndProhibitedFromDsfExecutor(executor) - Rarely used, it indicates that the given element can be accessed on any thread except using the given executor. An example of such a method would be the SyncDataViewer.getElements() method, which should never be called using the executor belonging to the data provider. Note: The DSF synchronization annotations are no more than a comment intended to help make the code more understandable and maintainable. Unfortunately, since there is no compiler enforcment of their presence, it is easy to forget to add them. Exercise 4: This exercise adds the appropriate synchronization annotations to the methods and fields of DataProviderWithExecutor. Look for comments preceeded with "// TODO Exercise 4" in the org.eclipse.cdt.examples.dsf.dataviewer.DataGeneratorWithExcecutor module. Exercise 5: It is all too easy to get into a deadlock situation. This exercise purposefully puts the data viewer system into a deadlock. The deadlock first renders the data viewer unusable, but the main thread also gets deadlocked when attempting to exit the program. Look for comments preceeded with "// TODO Exercise 5" in the org.eclipse.cdt.examples.dsf.dataviewer.SyncDataViewer module. The Timers example, found in the org.eclipse.cdt.examples.dsf.timers package, is used as a reference throughout the following sections. It is useful to get familiar with this example at this time. startTimer() method - Allows user to create a new timer. It returns the Data Model context for the new timer. killTimer() method - Allows the user to delete the given timer. It requires a timer context. getTimers() method - Returns the array of contexts for existing timers. getTimerValue() method - Returns the current value for the given timer context. TimerTickDMEvent event class - An event that is generated for every timer, every time its value changes (once per second). The event contains the timer's context. createTrigger() method - Creates a new trigger with a given value. It returns a context to the new trigger. deleteTrigger() method - Deletes the trigger for the given context. setTriggerValue() method - Sets the value of a trigger to the given value. getAlarm() method - Gets the alarm for the specified timer and trigger contexts. It returns an alarm context object. AlarmTriggeredDMEvent event class - An event that is generated for every timer that trips the given trigger by surpassing its value. The event contains an alarm context. The Timers example also features a user interface for displaying and manipulating the data in the example's services. The principal component of this UI is a view that can be opened by following the menus: Window->Show View->Other, then selecting DSF Examples->Timers View in the selection dialog. 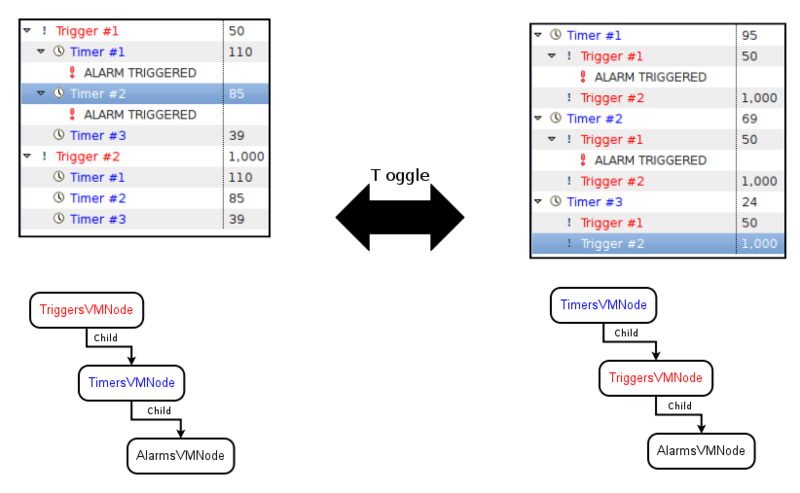 This view contains a tree viewer which displays the timers, triggers, and alarms in a hierarchy. The alarms are only shown when triggered and are automatically selected upon a triggered event. Screen shot of the Timers example's view. New Timer action - Adds a new timer, which immediately shows up in the view. New Trigger action - Opens a dialog where the user enters the value of the new trigger. Upon OK, the dialog creates a new trigger that is added to the view. Remove action - Removes a timer or a trigger, whichever is currently selected in the viewer. Edit Trigger Value cell editor - changes the value of the selected trigger. BundleContext.registerService() - registers a service, it returns a ServiceRegistration object which should be retained by the caller. ServiceRegistration.unregister() - unregisters a service. References - Clients wishing to use a service, need to obtain a reference to the service. OSGi features reference counting for services. BundleContext.getServiceReference(), BundleContext.getServiceReferences(), BundleContext.getAllServiceReferences() - methods for retrieving a reference to a service using a class name and/or a property filter. BundleContext.ungetService() - Releases a service reference and decrements its use count. Events - Clients using services should listen to service events. Events are issued when services are added/removed/modified. Note: The service APIs all use the BundleContext and they require the BundleContext to be active. This means DSF-based debugger integrations initialize after the plugin is started, but that they also shut down before the plugin is stopped. The first part is not difficult, but the second part usually requires that the plugin's BundleActivator.stop() method shuts down the debugger. DSF-based debugger integrations can register many services and there can be multiple instances of debuggers registering services with the same interfaces. To help coordinate services in a given debugger instance and distinguish the services between the instances of debuggers, DSF services are organized into sessions. Unique Session ID - This ID is used to distinguish services from different sessions. Clients may also obtain a session instance using an ID through a static method. Session Life cycle Events - Clients may register to listen when sessions are started and ended. DSF Executor - Each session has a (single-threaded) DSF Executor associated with it, though multiple sessions could share a single executor. More about session executor in the next section. Service Events - The session is used to dispatch service events. More on events in following sections. Model Adapters - A session allows an adapter to be registered, which will be returned by all Data Model contexts in a given session for a given adapter type. More information about Data Model is described in the Data Model section. All the services registered with the same session share a single DSF Executor. By convention, all public service interfaces should be restricted to being called in this executor thread. This point goes back to the primary synchronization mechanism of DSF. Following this rule greatly simplifies the task of protecting the integrity of service state information. Note: All service public methods should be called using the session's DSF executor. Tracks all services with a given class name or filter. Tracks all services within a given DSF session. 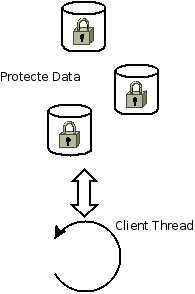 Thread safety Thread safe Restricted to the session executor thread. getServices() - returns all references matching the specified class/filter. getService(Class, String) - Returns the first service instance matching given class and filter. open() - Starts tracking matching services. close() - Shuts down and un-gets all service references. <constructor> - DSF services tracker can be used immediately after being constructed. dispose() - Disposes and un-gets all service references held by the tracker. Note: All service trackers must be disposed (or closed). Failing to dispose a tracker results in a service reference leak. Every DSF service must implement the IDsfService.initialize() and IDsfService.shutdown() methods. These methods can only be called in the session executor thread and are asynchronous. As the last step in initialization, a service should register itself. Likewise as the first step of shut-down a service should unregister itself. Also during initialization, each service should call DsfSession.getAndIncrementServiceStartupCounter(), in order to obtain the startup number of the service. This number is used in prioritizing the service events. Starting up a large number of DSF services requires calling a number of asynchronous method in a pre-defined sequence. Implementing this startup code can be cumbersome and DSF provides a utility for implementing it: org.eclipse.cdt.dsf.concurrent.Sequence. 27:     // Session to that the services are running in. 32:     // in the session thread. 51:                 // and is rolled back. 72:                 // Dispose the tracker after the services are shut down. 84:     // is used to identify the service. shared data in the ServicesShutdownSequence class. Line 81 implements the protected method used by the Sequence class to access the steps. Line 85 encapsulates the repetitive logic of finding and shutting down a given service. Line 73 disposes the DsfServicesTracker used by the sequence. Line 183 submits the sequence to the session executor. Line 185 calls the Future.get() method of the sequence to block the calling thread until the sequence completes. Note: Sequence implements the java.util.concurrent.Future interface just like the DSF Query object. However, if the sequence needs to be invoked from the executor thread, the Future.get() method cannot be used (or a deadlock would occur). Instead the sequence should be constructed with a custom request monitor to be invoked at the completion of the sequence. DSF provides a somewhat unusual event mechanism, where event listeners do not implement any particular listener interface. Instead, event listeners use the DsfServiceEventHandler annotation to identify listener methods. DSF finds the annotated listener methods using reflection. Call DsfSession.dispatchEvent(Object event, Dictionary<String, String> serviceProperties) method. The second parameter allows service listeners to filter events using specific service properties. Declare a public event listener method (method name is not important), which takes an event parameter. The type of the event parameter depends on the event, where the listener will receive all service events which can be cast to the declared type. A second optional parameter of type Dictionary<String, String> allows the event listener to examine the properties of the service that is sending the event. Add itself as a service event listener by calling DsfSession.addServiceEventListener(). Note: DsfSession.dispatchEvent() calls event listeners in a separate Runnable submitted to the session executor. This is significant because the event listeners may call other service methods changing the overall state of the system. It also implies that the event listeners are always called in the session executor thread. Note: Service events are prioritized. Listeners which themselves are services are called first, in the order that they were initialized. All other listeners are called after the services. The term Data Model refers to the natural structure of data that is being retrieved by the DSF services. One of the great challenges of creating an user interface for a debugger is that the amount of data that is available on the target is much greater than what can be practically presented to the user. Therefore the debugger services need to break up the data into chunks with appropriate granularity to achieve maximum performance and usability. The IDMContext represents a handle to a chunk of data in the Data Model. This interface is a minimal, yet central feature of the Data Model API. It is hierarchical. Contexts can have other contexts as parents. The hierarchy of contexts in a given system roughly defines that system's overall Data Model. It extends the org.eclipse.core.runtime.IAdaptable interface. This allows decorators, retargetable actions, etc. to be associated with a context. It is associated with a single DSF session. The IDMContext.getSessionID() returns the session ID of the given context. This allows all clients to get a handle on the session and the executor needed to access the DSF services that the context originated from. It is thread safe. This allows context objects to be stored and compared in viewers, caches, and other clients which may implement their own threading model. It is light-weight and preferably immutable. This allows contexts to be stored by clients that may persist beyond the life of the services that originated them. If a context holds references to a lot of data or it may prevent that data from being garbage collected. It is NOT a reference to a service. Context should not return a reference to a service directly because clients should use the appropriate OSGi APIs to obtain references to DSF services. It is NOT persistable. Since a context returns a context ID, it is valid only for the life of a single DSF session. Note: An IDMContext object can be used to retrieve any type of data object from the service. Although there is an IDMData marker interface defined, its presence it historical and its use is optional. One of the most powerful features of the IDMContext interface is that is is hierarchical. The IDMContext.getParents() method returns the immediate ancestors of a given context and following the parents' parents allows clients to traverse the full hierarchy of a context. 211:         // of the alarm. 219:         // Find the trigger and check whether the timers value has surpassed it. 221:             int timerValue = getServicesTracker().getService(TimerService.class). Lines 212 and 214 search the context hierarchy of the alarm context for the timer and trigger contexts. Note: Methods that take a context as an argument can specify the generic IDMContext as the argument type, then search this context for a specific context type. The benefit of this technique is increased flexibility, at the cost of compile-time type checking, and it is used throughout DSF to avoid dependencies between service interfaces. getAncestorOfType() - Searches for a context of a specific type in the hierarchy of the given context. isAncestorOf() - Checks whether the one of the argument contexts is in the hierarchy of the other. toList() - Converts all the contexts in a hierarchy of the give context into a list. View Model refers to the ideal user-presentable structure of the data. This is in contrast to the Data Model, which refers to the natural data structure, although the two often end up being the same. Never the less, the needs of the user presentation often change so the central feature of the View Model is the ability to customize it. There are provider interfaces for every aspect of data presentation in the viewer (content, label, columns, etc.). The provider interfaces are retrieved by the viewer for each element in the viewer. This allows the view content to be populated from multiple sources. Note: Flexible Hierarchy is still a provisional API in Eclipse Platform 3.4. This virtually guarantees that DSF will break backward API compatibility in future releases. However, these APIs have now been widely used by open source projects such as DD and CDT and also by many commercial Eclipse integrations, so the API changes are likely to be small and mostly related to packaging. For more information about the flexible hierarchy API, see the Debug Platform: Custom Integration tutorial at EclipseCon 2008. The flexible hierarchy is described in the presentation starting with slide 29. The number two feature of flexible hierarchy API is implemented using the adapter pattern. One down-side of the adapter pattern is that there can only be one instance of an adapter of a particular type registered for a given element. For flexible hierarchy providers, it means that each provider must implement the element presentation logic for every view that the element appears in, and as a result adding a new view can force changing a large number of modules. Diagram illustrating problem of multiple views sharing a single element, when using the adapter mechanism. Note: The limitation of posed by the adapter problem can best be obseved with the Standard Debug Model implementation of the Flexible Hierarchy API. If a developer would like to extend the Java Debugger to provide a custom Label Provider for a Java Stack Frame, than that developer would have to extend the Java Stack Frame object in order to register that new Label Provider for it. There is a second major challange in implementing the flexible hierarchy API, which stems from the different life-cycles of the Content Provider and Model Proxy objects. Content Providers life cycle is managed by the model. The viewer requests a reference to the Content Provider for each element separately, and this instance of the Content Provider can be a static object, or a newly created object for each request, or it could be the element itself. Model Proxy is created through the IModelProxyFactory adapter, and it is instantiated and disposed by the viewer as needed. 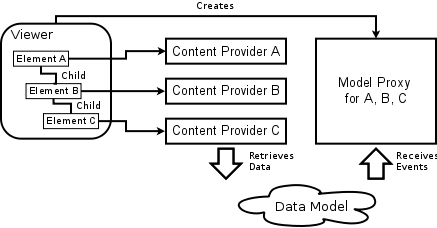 Diagram illustrating problem of separate Content Provider and Model Proxy lifecycles. In practice this arrangement means that the content provider and the model proxy are implemented using separate object. However, both objects need to have knowledge of the layout of elements in the view in order to function correctly. The DSF View Model is a collection of objects which retrieves information from a data model and uses that information to pupulate the content of one or more Flexible Hierarchy viewers. Note: DSF View Model can be used to represent any data model. There are features in the DSF Data Model which make it easier to represent it using the View Model, however these features are not strictly necessary. 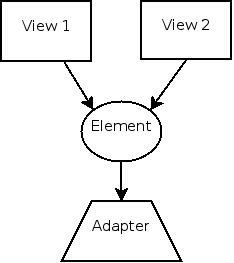 VM Adapter - The adapter is the top-level object in the view model hierarchy. All the content updates from the viewers are handled by a single instance of the VM Adapter. The VM Adapter then delegates the handling of these updates to the appropriate VM Providern based on the presentation context contained in the update object. VM Provider - The provider manages the content for a single view. It delegates content requests to the appropriate VM Node, based on the tree path of element in the update object. VM Node - The VM Nodes allows for grouping of like-elements in the view. Examples of such nodes are: threads node, stack frames node, variables node, etc. The VM Node creates VM Context objects to represents elements of data in the Data Model. View Model Design Diagram and Content update handling. Note: The most important feature of the DSF View Model design is how it overcomes the Adapter Problem. The VM Contexts are used to redirect getAdapter() requrests from the viewer to the appropriate object. In this way a particular can have many different View Model representations, rather than just one. The primary design goal of the View Model is to make it easy to customize the layout and other presentation aspects of a given data model in a viewer. The easiest way to explain how this customization looks like is to use an example. Timers - Timers have a value that is incremented each second. The are independent of any other elements. Triggers - Triggers have a constant value assigned by the user. Alarms - Alarms represent a timer combined with a trigger and there is a separate alarm object for each combination of a timer and a trigger. 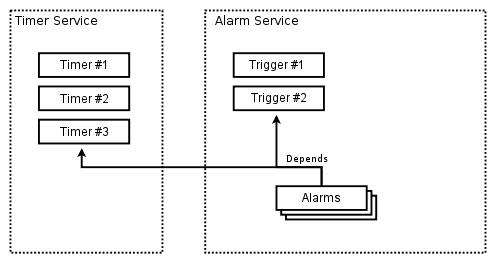 An alarm has a state, which is either triggered or not triggered. When presentated in a view in a tree hierarchy, either the timers or the triggers can be shown as top-level elements. In the View Model, the layout configuration is controlled by the configuration of the VM Nodes within a given VM Provider. This configuration can be easily changes as it is done in the Timers example (see figure below). Another important job of the View Model is to translate the events that originate from the Data Model into generic events (model deltas) which the viewer can use to update itself. These model deltas are low-level descriptions of exactly which elements in the viewer have changed and what has changed about them. Some of the updates to the viewer even require a full path to the element that was changed, including indexes and number of children for each element in the path. The VM Provider receives the vent from the Data Model. The VM Provider calls the IVMNode.getDeltaFlags() for each node to determine whether a model delta needs to be generated for a given event. If a delta is needed, VM Provider calls IVMNode.buildDelta() for each VM Node, building up the delta as it works down the node hierarchy. After all the nodes were called, the completed delta is sent to the viewer so that the viewer may refresh itself. The following is an example of a debug trace output from a model delta generated by the Timers example. This delta causes the "alarm" element to be added and selected in the view. 143:         // label has changed. 154:             // Add delta indicating that the given timer has changed. 159:             // elements from this node. Lines 141 declares the getDeltaFlags() method, which tells the event processing logic what flags if any can be generated by the given node for the given event. Depending on its return value, the event processing logic may or may not call the buildDelta() method. Lines 144-148 return appropriate flags for the events that this node can process. Lines 153-155 process the TimerTickEvent. They add a delta element corresponding to the changed timer instructing the viewer to repaint this timer. Lines 156-160 process the TimersChangedEvent. They add a flag to the parent delta element, instructing it to refresh all the elements managed by this node. It is possible for the Data Model to generate events at a faster rate than the ability of the View Model and the viewer to process the events. In these cases it is more optimal for the View Model to skip processing some events to keep up with the Data Model, but still keep the viewer updated. The VM Provider has an API (IVMProvider.canSkipHandlingEvent()), which can be used to implement event coalescing for specific use cases. The IElementPropertyProvider interface is not actually part of the Flexible Hierarchy API, but an extension interface added by DSF. View Model implementers can use the property provider to configure an IElementLabelProvider object that the Flexible Hierarchy viewers call in order to get element presentation details. Line 55 creates the label provider. Lines 58-62 create the display attributes to use in the Name column. These attributes use named properties as parameters in calculating the data, such as the label string. Line 64 registers the column info object with the label provider. 120:         // If either update or service are not valid, fail the update and exit. Lines 117-118 call a convenience method to extract the Data Model timer context from the viewer update. Normally this requires casting the object returned by IViewerUpdate.getElement() to the expected VM Context class. Then extracting the model object from the VM Context wrapper. Line 127 retrieves element data from the service. Lines 136-137 write the element properties into the property update. In some use cases, it is desirable to freeze a given view from updating and to preserve its content even if the underlying data has changed. This is a particular challange for Flexible Hierarchy views because they are lazy-loading and cannot be relied on to hold the data that they have retrieved. The viewer or another client requests an update (current the cache supports daving element content and element properties data). The cache checks whether there is already cached data for the element in the update. If update data is in cache, skip to Step 8. If data not in cache, the cache creates a new update object, which is a proxy for the original viewer update. The VM Provider forwards the proxy update to the VM Node to complete. The VM Node completes the update, fetching data from the Data Model as needed. 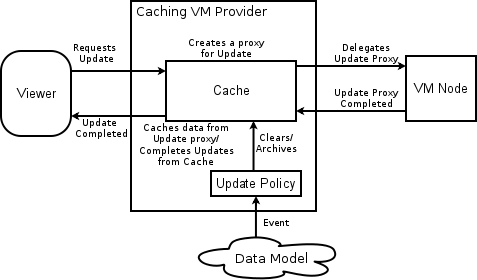 The cache receives the completed proxy update and saves the data from proxy. The cache completes the viewer update using data from cache. Note: Theoretically the cache is completely transparent to the VM Nodes. I.e. no additional new logic in fetching data from the data model is required when switching to the Caching VM Provider. A common use case in debugger views is to indicate to the user whether a particular value in the viewer has changed since the last viewer update. To support this feature, the cache is able to save the last known value of an element upon cache reset. The label provider can retrieve this last known value and compare it to the current value to determine if the element should be hi-lighted in the view. Automatic - Clears the cache upon any and every event from the Data Model. Manual - Clears the cache only in response to user request for refesh. Breakpoint Hit - Clears the cache upon a Breakpoint Hit event and user request for refresh. 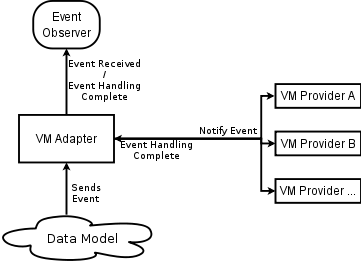 The VM Adapter listens for the events from the Data Model (normally the VM Providers are the event listeners). When the VM Adapter receives an event it forwards that event to all the known VM Providers. The VM Providers process the event and when the event is fully processed, the VM Provider notifiy the VM Adapter that the event handling is complete. When all VM Provider complete handling the event, the VM Adapter notifies the event observer. Comparing data from different elements (stack frames, threads, cores, etc.) is a common task in debuggers. It would be ideal if the debugger offered a "compare" view mode where data from different contexts is displayed side by side and differences hi-lighted. The DSF View Model already uses wrappers and has other features in place that should allow this feature to be implemented. The View Model cache is currently able to save the last known value of each element that is shown in the view. This feature could be extended to save not just the last value, but to save its entire contents as the views are being updated in response to Data Model events. This data history could then be presented to the user in very much the same way as local file revision history is shown in the History view. DSF uses Java 5 features including: generics, annotations, and the concurrency package. The Platform project is very conservative and is resistant to switching to Java 5. One option may be to keep the generics and use the Java 5 compiler to produce Java 1.3 compatible byte code. DSF relies on the Flexible Hierarchy viewer, which itself is a provisional API. The Flexible Hierarchy viewer is a general viewer feature and it should be part of the Platform's UI component rather than the Debugger. Contributing Flexible Hierarchy to UI would require significant refactoring before it would be accpted. Ideally the JDT debugger should take advantage of DSF to provide a compelling use case for this technology in the SDK.